Even in a Microsoft-free world the Samsung Galaxy Book would be a frustrating device. Ostensibly it’s a Surface clone: A souped up Windows tablet with a pen for drawing and a floppy keyboard for typing. In practice, it’s an expensive machine that has me longing for any other computing device. The screen looks great, but a cheap pen, bad cooling, and a high price make it a non-starter. The Samsung Galaxy Book feels like the first big flop of Samsung’s newly invigorated computer brand. Two years ago Samsung had nearly fallen out of the computer game. It had a few Android tablets, and the very nice line of Galaxy phones, but on the Windows side of things there was just the ATIV Book 9. It was a decent laptop, but hardly spectacular enough to warrant any kind of fandom. Then in 2016 Samsung started pouring its energy into making really good Windows machines. The Notebook 9 was crazy light and practically perfect (apart from battery life), the Samsung Galaxy TabPro S had the kind of gorgeous display usually only found on smartphones, and the Samsung Notebook 7 was the inexpensive workhorse laptop college kids had been denied for too long. The Galaxy Book uses the case as a hinge and it is exactly as flimsy as you’d expect. This year, Samsung’s continuing to build on the momentum with an expanded line of really good laptops like the 15-inch Notebook 9. The Samsung Galaxy Book, which replaces the terribly named Galaxy TabPro S as Samsung’s Windows-based Surface assaulter, is not one of the really good ones. The keyboard is much improved! Yes, the new device is an improvement in some respects. It comes in two sizes where the TabPro S was available in one. You can buy a Galaxy book in either a 12-inch or 10.6-inch form, with the 12-inch having a speedy Kaby Lake i5 processor that is faster than a Surface Pro 4, and the 10.6-inch version having a Kaby Lake Core m3 processor that should be faster than sixth generation Core M processor in last year’s Galaxy TabPro s. It’s also got a much improved Surface-like keyboard, that’s still not a dream to type on, but infinitely better than the cramped monstrosity the Galaxy TabPro S was saddled with. The 12-inch version even has HDR, on the off chance you’re watching Netflix on the Edge browser. We didn’t get a chance to check out the 10.6-inch version with an LED display, but the OLED screen is one of the highlights of the 12-inch device, with its blacks so rich they blend into the bezel and crisp text that never hurts your eyes. This thing renders vibrant colors that will make your friends with iPads and Surface Pros very jealous. This thing does a fantastic job with colors. But that’s likely where their jealousy, and your pride, will end. 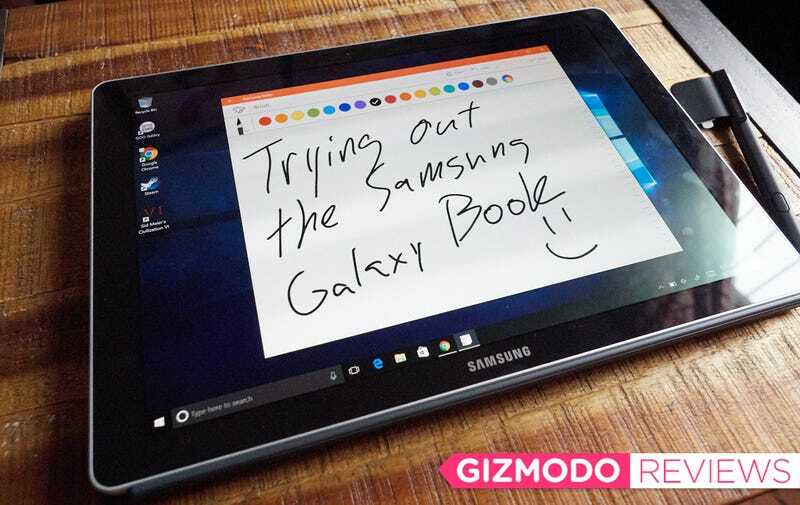 The Galaxy Book gets noticeably warm when in use. That’s fine for a high powered laptop insulated by your thighs, but it’s ridiculous for a hybrid device you frequently hold in you hand or balance on your forearm. While the heat isn’t bad enough to cause damage to your skin, it is noticeable. And it gives you that weird uneasy feeling you’re overworking the device, and that it might keel over and die like a panting racehorse. The pen is also bad. The S Pen, Samsung’s pressure sensitive input device, is great on the Note series of phones (rest in fire), and it’s even nice on the Samsung Chromebook Pro. Yet those are all sub $1000 devices. A 12-inch Galaxy Book starts at $1130. That’s the same price as an iPad and Pencil, a Surface Pro 4, or even the new Surface Pro announced by Microsoft earlier today. The pen comes with a dorky holster you’re supposed to attach to the case yourself via sticker. The S Pen feels cheap, and the shortcut button, which operates like the right click on a mouse, lies right where my thumb rests when holding it with a writing grip. That leads to a lot of accidental clicks. Yet while I found the pen to feel cheap and irritating, and noticed some lag when drawing in Samsung’s Notes app, I am also not an artist. So I went to Jim Cooke, Gizmodo’s Art Director and illustrator. Jim spends his days at a professional Cintiq station, and his nights in front of an iPad with Pencil, and knows his digital drawing devices. “It’s bad,” he said after a few minutes of scribbling with the S Pen on the Galaxy Book. His biggest concerns were with how the pen seemed to skate across the glass, and with the feel of the pen itself. He found it too light and flimsy. “This is nothing,” he said, wagging the pen for effect. Furthermore, the pen feels like an afterthought. There’s no simple storage on the laptop for the pen. It won’t magnetically attach to the side as on a Surface. Instead Samsung included a little sticker you can attach to the case and then slip the S Pen into. That’s very stupid. And you’d have to be very stupid to reach for the Galaxy Book at its current price. While the slower 10.6-inch version goes for a very reasonable $630, the flagship 12-inch version starts at $1130 and can go for up to $1330 if you opt for 256GB of storage instead of 128GB. For that kind of money the Galaxy Book simply isn’t worth it. Samsung will need to fix the pen, and the heat issue if it wants people to drop $1000-plus dollars on this admittedly gorgeous slab of glass. It consequently gets very hot. For the price you’re better off holding onto your money and waiting to see what Microsoft’s New Surface Pro has in store.